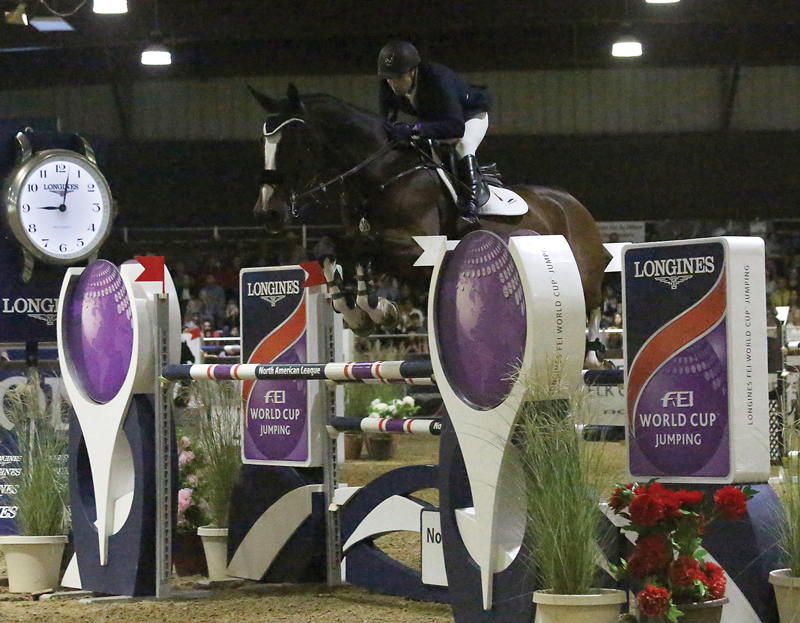 In the first indoor competition of the 2016 Longines FEI World Cup™ Jumping North American League season, an international and bicoastal field of 28 contested under the lights. Out of a jump off of eight horse-and-rider pairs, Audrey Coulter (USA) and Capital Colnardo rose to the occasion to claim victory in the $100,000 Longines FEI World Cup™ Jumping Sacramento at the Sacramento International Horse Show CSI3*-W.
The course, set by Guilherme Jorge (BRA), incorporated two combinations, a double and a triple, bending lines, and short turns off the rail. From the first fence—which multiple riders had down—it was evident the riders needed to maintain a quality pace and a defined track to record a clear round. The first in the class to cross the timers without a single fault, Christopher Surbey (CAN), fresh off his speed class win the evening before, demonstrated his understanding of both the course’s and the arena’s challenges with a clear round aboard Arezzo (Querlybet Hero x Walzertakt). A few rounds later, Jenni McAllister (USA) guaranteed a jump off when she rode fault free with Legis Touch the Sun (Nekton x Capitol I). Six more riders accomplished the same impressive feat to join the final round’s order: Guido Klatte Jr. (GER), Georgina Bloomberg (USA), Eduardo Menezes (BRA), Richard Fellers (USA), Audrey Coulter (USA), and Jessica Springsteen (USA). For the jump-off track, with seven obstacles and eight jumping attempts, there were two parts of the course that offered inside turn options. The first option was immediately before the double combination, and the second option came in advance of the very careful skinny vertical. No rider attempted to take both options, if he or she decided to even take an option. All faults recorded in the final round, including a refusal from Klatte Jr.’s mount Qinghai (Quidam de Revel x Cordalme), could directly be attributed to taking the tighter, inside turns. But it was only Coulter, who not only took the inside turn to the skinny vertical but also shaved a tight turn off the rail to the second oxer, that managed a clear round under 40 seconds. It was a milestone win for Coulter—who also won Thursday’s qualifier with the 11-year-old, Holsteiner stallion (Colman x Coronado)—as her first FEI World Cup™ qualifier victory. Riders from three different countries stood on the podium by the night’s end. Rio Olympian Eduardo Menezes clocked in just under a second slower than Coulter, showcasing his upcoming talent, the 9-year-old, Oldenburg mare Catalina (Chacco Blue x Converter). The third-place finisher Surbey also rode a mount new to this level of jumping and competing. Kent Farrington mentioned, following his win in the $216,000 Longines FEI World Cup™ Jumping New York, that he would need to find the indoor specialist in his string for the Longines FEI World Cup™ Final in Omaha. So in contrast to Gazelle, his winning mount in the large, grass field at Old Salem Farm in September, Farrington opted to ride Creedance, a 9-year-old, KWPN gelding (Lord Z x Notaris) for the second leg of the West Coast sub-league. But as the horse passed the packed crowd against the rail, mixed in with the shadows from the evening class under the lights, he appeared to spook and not come forward, forcing an uncharacteristic first rail for Farrington, eventually landing the pair at 11th place. Other early favorites also ended the night with at least four faults. Last year’s winner of the event, Samuel Parot (CHI), finished on a single rail in the first round, in addition to Karl Cook (USA) aboard Tembla, the victors from the first leg of the West Coast sub-league in August. The riders finished 10th and 12th, respectively. Coulter noted that riding in the smaller, indoor ring was an adjustment after most of the year spent competing in large, outdoor arenas. “I think he’s a really smart horse and he learns quickly,” she added. He’s such a special horse. I think he can jump anything, and he gives me all the confidence in the world. We’ve been working on the speed a little bit, because he wasn’t the fastest to begin with, but he picks up on it quickly. And this is our first major win and I’m very happy. Coulter made her first Longines FEI World Cup™ Jumping Final appearance in March 2016, at the Gothenburg Horse Show. With the experience under her belt, she expressed her hope of qualifying again this season, which will be held at the International Omaha, March 27 to April 2, 2017. Coulter will next try to earn World Cup™ qualifying points at the third leg of the West Coast sub-league at Del Mar CSI3*-W, on October 22.